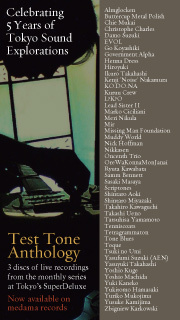 Texture, rhythm and movement in all of its disguises, this anthology disc captures the myriad of expression that has become the hallmark of the Test Tone series at Tokyo’s SuperDeluxe. This third disc in the Test Tone Anthology series pulls no punches, offering an insider’s view of what goes on outside of business hours in downtown Tokyo. An exhilarating dose of tumultuous noise-rock, leftfield jazz freakouts and other explosive encounters make this a compilation for the truly brave at heart. Jahiliyyah presents a howling scrum of ecstatic durge from the daylight-deprived bowels of Tokyo. Replete with all the glopshod trappings you come to expect from a precarious flossing session, this remains in gran’s dentures until the tea gets cold. Ancient casiotone purges, or the best music money can buy?